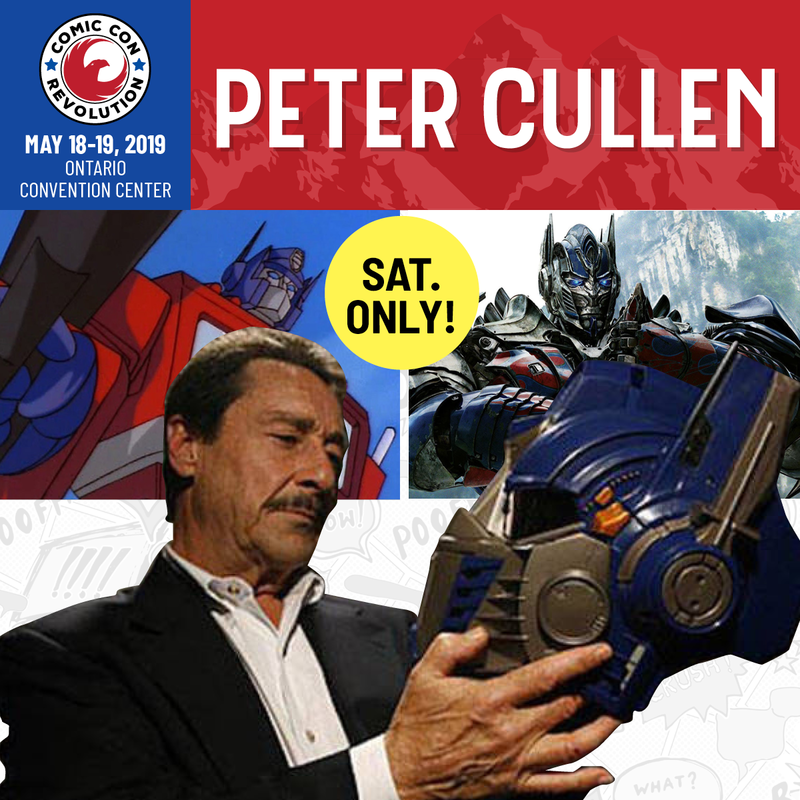 New York, Wednesday, October 24, 2018 - Atomic Crush Events' (ACE) Comic Con Revolution Ontario (CCR ONT) is proud to announce that voice acting icon Peter Cullen will be attending this year CCR ONT on Saturday, May 18. CCR ONT is currently Cullen’s only scheduled appearance in California for 2019. Cullen is best known as the voice of the unforgettable leader of the Autobots – Optimus Prime! He has voiced the character in the Transformers movies, cartoons and video games for nearly 35 years. Other notable roles include The Transformers' Ironhide, Disney’s melancholy loveable donkey Eeyore, Chip 'n Dale's Rescue Rangers' Monterey Jack, the evil KARR of Knight Rider fame, Voltron's King Alfor and many, many more. Guests scheduled to appear include: Matthew Atchley, Sweeney Boo, Evan Cagle, Sandy King Carpenter, Ming Chen, Amanda Conner, Neo Edmund, Joe Eisma, Adam Faberman, Carlos Ferro, Joel Gomez, Steven Gordon, Matt Haley, Travis Hanson, Chad Hardin, Ray-Anthony Height, Megan Hutchison, Santa Inoue, Ryan Kincaid, Mike Kunkel, Ian McGinty, Rafael Navarro, James O’Barr, Pernile Orum, Jimmy Palmiotti, Jules, Rivera, Stan Sakai, Patrick Scullin, Beth Sotelo, Angi Viper, Mike Wellman & Mike Zeck. Early bird pricing will be available until December 31, 2018. Tickets purchased at the door will be $5 more per ticket. In addition to the savings, advanced ticket holders will receive a limited edition art print, as well as being able to enter the exhibit floor an hour early each day. Atomic Crush Events is an event consultation, management and production agency that was founded on experience and innovation. Bringing together expertise in event management, marketing, sales and business development to create a unique team that will conceptualize your idea and bring it boldly to life. Our philosophy is simple — create the best experience possible for attendees, exhibitors and guests alike. L.A. Comic Con 2018: L.A. Comic Con is TODAY!